The view from my balcony at the Le Gray hotel in Beirut. Photo by David Lansing. All day long I walk the streets of Beirut, getting lost down crammed side streets full of old and new clothing stores, bookstores, record shops. I stop in a tiny old bakery and order a man’ouche, the doughy Lebanese flatbread smeared with olive oil and zaatar—a spice mix of sumac, thyme, and sesame seeds—served hot from the oven. It is comfort food. Why does this city make me feel so sad? Why do my senses focus on the sound of an unseen baby crying in the dark apartment across the street, the compulsive honking of cars, the melancholy call of the muezzin’s call to prayers from the mosque nearby. As it turns out, my new hotel, Le Gray, is next door to the white tents where former Prime Minister Rafiq Hariri is buried. 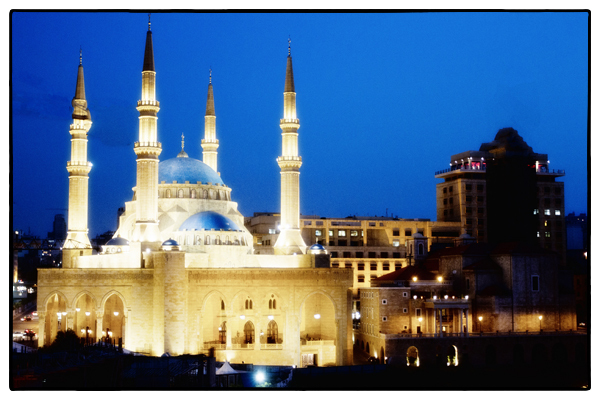 I go up to my room just before sunset and stand on the balcony which faces the Mohammed al-Amin Mosque. The sky bruises as the muezzin begins the call to prayers. It is the saddest thing I’ve ever heard, breaking my heart as I look out over the shadowy city. I take a long, hot shower, crawl in to bed, having decided to skip dinner, and close my eyes, though I know sleep will be a difficult thing tonight. An excellent photo; really beautiful. I’ve never personally heard the muezzin’s call to prayers, but just from films, I can feel that other worldly sound. And then, you are right there. Right there where so many are no longer.